This distinguished business card holder is a matte and gold two tone finish with a beautiful concave shaped casing. It can easily store up to 15 business cards or up to 6 credit cards. The high polished gold finish is a nice contrast with the silver matte casing that looks really nice with a personalization. 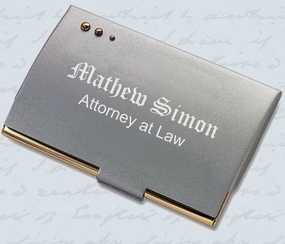 Both sides of this contemporary card case can be engraved.